Next Scheduled meeting(New Member Orientation and Speak Out) is on Thursday April 25th at 6:30pm. Location: LLC 122, Library Learning Center, 1st Floor. All new members please make an effort to attend this meeting. Overcome Fear of Public Speaking! Welcome to LIU Brooklyn Toastmasters Club! Toastmasters is the most efficient, enjoyable and affordable way to enhance your communication and leadership skills. We provide a supportive and positive learning experience to help you develop the skills and confidence to express yourself in any situation. Our club serves communicators of all levels. 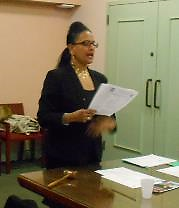 LIU Brooklyn Toastmasters is about more than making speeches! LIU Brooklyn Toastmasters is about people. When you arrive at a Toastmaster meeting, you are greeted by one or more Toastmasters and embraced in a warm, friendly environment. We believe the success of the club is dependent on the personal growth of its members. Visitors are always welcome. We encourage you to attend two free meetings, before deciding if LIU Brooklyn Toastmasters is the club for you!